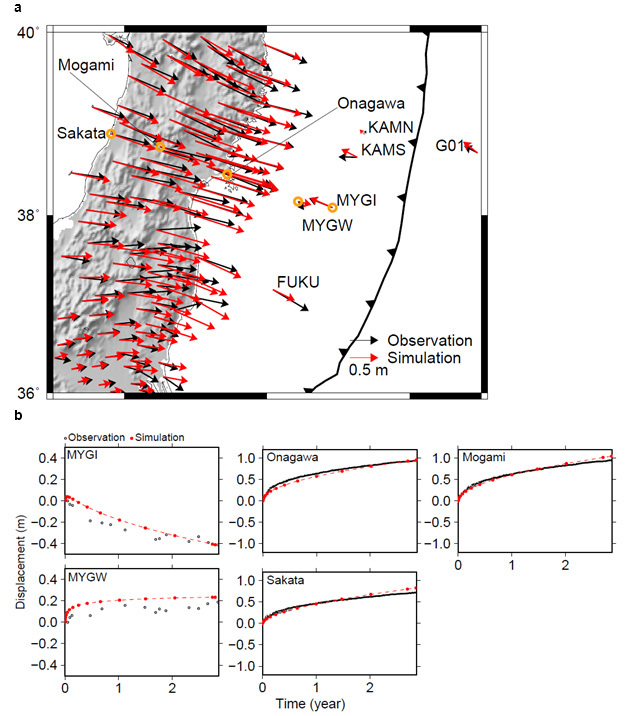 A new hypothesis that explains the factors responsible for post-seismic deformation observed after the 2011 Tohoku-Oki earthquake is proposed using a large-scale numerical simulation that incorporates the empirical rock flow law. For post-seismic deformation to occur based on the observed displacements, previous studies have suggested the necessity of rapid mantle flow in the upper mantle beneath the Pacific plate. However, the physical factors responsible for rapid flow are still not fully understood. Our results raise the possibility of understanding, in general terms, post-seismic deformation in a subduction zone earthquake based on test minerals and petrological results. Moreover, they suggest that there are cases where empirical laws for mantle flow must be considered both in the earthquake preparation process and sequence prediction. Ryoichiro Agata, a post-doctoral fellow at the Research and Development Center for Earthquake and Tsunami of the Japan Agency for Marine-Earth Science and Technology, and his colleagues studied post-seismic deformation (Fig. 1) that occurred after the 2011 Tohoku-Oki earthquake in collaboration with the University of Tokyo, RIKEN, and University of South California. They performed a large-scale calculation that incorporated empirical laws to model mantle and fault movement. As a result, they have proposed a new hypothesis that explains the factors responsible for the observed post-seismic deformation. 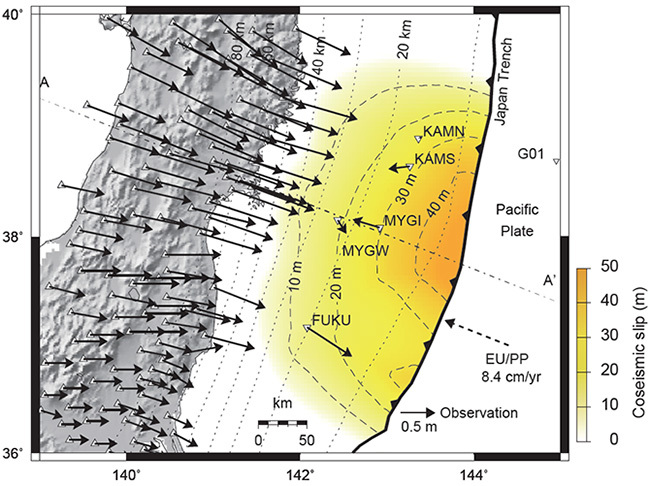 Previous studies have suggested that rapid flow in the upper mantle underneath the Pacific plate caused the post-seismic deformation observed after the 2011 Tohoku-Oki earthquake, although we still do not fully understand its generation mechanism. In this study, the team performed numerical simulations of post-seismic deformation for 2.8 years after the earthquake. The simulations incorporated experiments on minerals and rocks and were conducted using the K computer at RIKEN and the fast calculation method for rock deformation developed for the K computer (Fig 2). The simulation results agree with data on observed post-seismic deformation, which demonstrates that the empirical laws for mantle flow and friction can sufficiently explain the generation mechanism of post-seismic deformation (Fig 3). 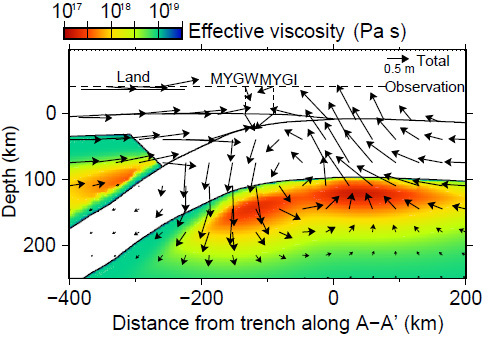 Their results raise the possibility that rapid mantle flow mentioned in previous studies may result from the “power law” within the mantle flow model (Fig 4). To understand the generation mechanism of post-seismic deformation and its replication via numerical simulations plays an important role in understanding how the land that we live on can change in the future and is essential for urban planning and disaster prevention. This study group will use the state-of-art computers to expand the scope of physical law application to improve the earthquake simulation method that accommodates post-seismic deformation. This study was supported by the Grant-in-Aid for JSPS Research Fellow No. 14J08867 and the Post “K” project priority issue 3 of the Ministry of Education, Culture, Sports, Science, and Technology. The results in this study were obtained using the K computer at RIKEN (Project Number: hp160221, hp170249, and hp180207). The results discussed above were published in Nature Communications on March 26, 2019 (JST). Figure 1. Horizontal displacement and basic information on the surrounding areas near the epicenter 2.8 years after the 2011 Tohoku-Oki earthquake. The alpha numeral next to each seafloor observation point refers to the name of the observation point. The orange gradient is the slip model for the 2011 Tohoku-Oki earthquake used in this study. The dotted line represents the plate boundary depth. The line denoted by A-A’ is the cross-section used in Figure 3. The observed displacement in land area is based on data from the GEONET data provision service from the Geospatial Information Authority of Japan and the observed displacement in the water area is based on Watanabe et al. (2014, GRL). Figure 2. The numerical simulation model used to calculate post-seismic deformation in the 2011 Tohoku-Oki earthquake. a: Entire image b: Magnified view of the area enclosed by the red rectangle shown in a. The viscoelastic and elastic layers are layers with and without mantle flow, respectively. c: A magnified view of the area enclosed by the black box in b. The team used a fine computational mesh that can calculate mantle flow. Figure 3. a: A comparison between the observed and calculated displacement values 2.8 years after the 2011 Tohoku-Oki earthquake. The team was able to sufficiently replicate the complexity observed in the displacement distribution. The observed displacement at G01 is based on Tomita et al. (2015, GRL). b: A comparison between the observed values of temporal displacement at the orange circles indicated in a. The calculation results correspond particularly well with the observed values at these orange circles. The calculation results matched particularly well at MYGI and at three points on the land area. Figure 4. The calculated displacement 2.8 years after the 2011 Tohoku-Oki earthquake along the cross-section represented by the A-A’ line shown in Figure 1. The “power-law” within the physical mantle flow model locally and temporarily reduces the viscosity rate, which is a factor that influences the mantle flow speed. Thus, the calculations indicate rapid flow, as depicted by the black arrows.